Autumn and winter can mark the start of difficult road conditions for caravanners and motorhome owners, so it’s important to make sure your leisure vehicle is ready for any weather. October is Tyre Safety Month and this year, charity TyreSafe, is urging motorists to “tune into tyre safety” and check their vehicle’s tyres once a month, every month. TyreSafe is reminding motorists to “get down” and check their tyres all year round – not just October or in bad weather – but throughout all the seasons. They say drivers shouldn’t be complacent about tyre safety as they reveal that more than half are driving on poorly maintained or defective tyres, with 57 per cent of of tyres underinflated and 27 per cent already illegal when they’re replaced! Worringly, according to Department for Transport figures, there are significantly more casualties caused by tyre-related incidents than by drivers distracted by mobile phone use. And national home-fit tyre specialists TyresOnTheDrive have reported that many tyres they replace are in a dangerous and illegal condition. He added that although selling part worn tyres is legal, recent investigations have found as many as 94 per cent of the tyres tested do not comply with current regulations and 58 per cent have safety-related defects. TyresOnTheDrive is now backing TyreSafe’s campaign – ‘Part worn equals part safe’ – which warns motorists of the potential dangers. TyresOntheDrive is offering our readers an exclusive 5 per cent off an order of two or more tyres from their range. 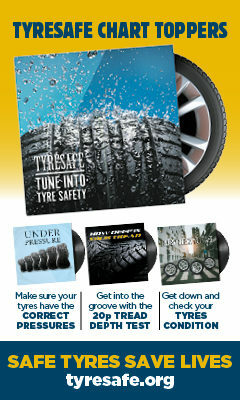 To find out more and to use the discount simply visit www.tyresonthedrive.com, select your tyres and enter the code CARAVANGUARD5 in the basket. 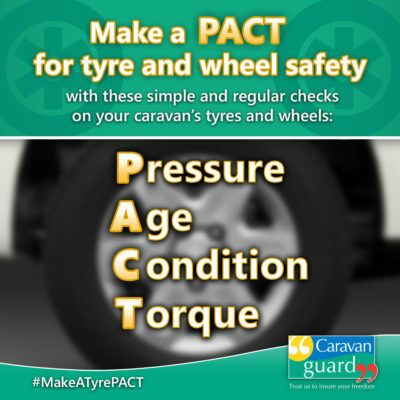 Earlier this year we called on caravanners to make a PACT for tyre safety by carrying check the pressure, age, condition and torque of the caravan’s tyres and wheels. Check the pressure of your caravan or motorhome tyres before every trip. Check pressures when cold and then make sure the valve is not leaking and valve caps are replaced. Make sure tyres are in a good condition and have no signs of damage, bulges or cracks. Remove stones or other road debris that might have got stuck in your tyre’s treads and if there is any damage get your tyres checked out by a professional. 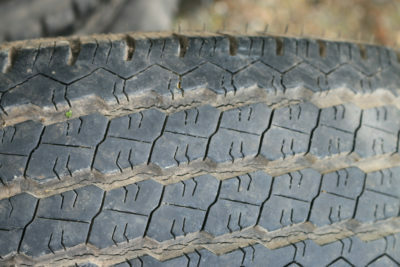 Check your tyre tread depth. Check the age of your caravan or motorhome tyres and replace any that are over five year’s old, irrespective of remaining tread. Don’t overload your motorhome or caravan. I agree with tyre checks . jusyt done ours in a services on the m5 so caravan tyres would have been warm. stupid question but how would I check tyres when cold and how? I carry out the recommended checks on my caravan tyres and try to move my caravan just a half turn of the wheel every few weeks when it is not in use to vary the part of the tyre the caravan is sitting on. I place a chalk mark on the tyre so I can check it isn’t back on the same spot. I had Tyron bands fitted when I renewed the tyres – what is the current thinking regarding Tyron? Is it still something recommended for additional security? Thanks! Good practice Caroline. Tyron bands are a recognised safety device and we do offer a small insurance discount if they’re fitted to your caravan. I agree mostly with the article, but I use my caravan twice, maybe three times a year at most, and I’m strictly a fine weather caravaner.I travel to a site,stay for upto a fortnight and return home.My wheels come off in the winter and are stored in my garage.My tyres are now five years old and look as good as new and I will probably replace them before next season, but do they really need to be replaced, with so little use and winter storage?The rubber can’t have deteriorated that much, surely. 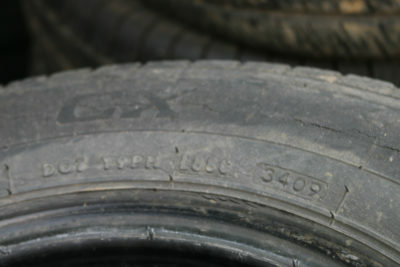 It’s worth getting them checked out by a tyre specialist to have them looked are make sure they’re still safe to use. I check every trip but also have TyrePal fitted to both the Caravan and Ower SUV which gives readings all the time when traveling both pressure and tempricher there is a warning if they go above or below the settings, I check the tyre date and tread even the valve. Also check the wheel nuts before and after a journey AND if the wheel has been taken off check after 30 miles too but use a torque wrench. We lost a wheel following a caravan service. The person who did the service was not responsible, I was as it’s the caravan manual. 100% agree with what’s being said. I did the best part of 30 years as a traffic cop I dealt with rather a lot of “Fallen over” caravan incidents. Almost every one had a damaged/shredded tyre, evidenced by the charred remains left on the wheel. Some form of Tyre Pressure Monitoring system should, in my view, be a COMPULSORY fitment on all caravans. Never ever ever take any chance at all in respect of tyres, replace them every five years AT LEAST, or when they get down to 2.5mm don’t wait until they get down to the wear markers.